Mark I will be watching this post. I'm up in Louisville KY. area but I might travel down to east Tenn. or GA. Keep us posted ! 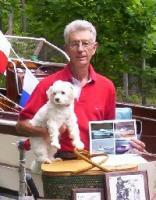 There are two Georgia dates that I know of, showing wood boats, April 15 , 16 lake Hartwell , Marina. may 14 lk Sinclair ,eaton, GA.
. A great free outing for Outboard boats will be the Friday may 20 & Sat may 21 in Louisville , Tenn,(South west Knoxville) at the town park . This is first year for wet meet & heard local hotels will be cuttin a deal to promote. . About one mile north of the Allison plant. . Usually is the annual rally of the Feather Craft club, polished Al cruisers , mfg in Atlanta. Great seeing you at Hartwell. Yes! Very interest in a summer informal meet. After Chatuge (June) we're showless until Charlotte (Sept). Went to have some canvas work done today and found another Nineteen. It's in WAY better shape than the one we have now. I think it would be something fun to do. But as I'm in south west Ohio Tennessee would be about my limit. I dont think I could make anything in GA. Its about 5 hours for me to make to the Tn. state line. If you can do something that would work for me I think it would be great to meet you guys. As Mentioned above, the South West KNOXVILLE, TENN show has been expanded to a TWO day IN Water event. May 20 - 21 .On rt # 333 know as Louisville, town park , right next to ALLISON factory. Should be FREE show , WOOD , Fiber Glass , Polished Aluminum , other antique machinery, bicycles, buy , sell, etc. GREAT FAMILY Event. Hello . Yes the Feather Craft meet starts May 14t at Lake Norman NC. It is a wet event and there should be at least 17 boats there. The event will run from Saturday until Thursday morning. From there a caravan will be formed Thursday morning from Lake Norman to Lousiville TN . We should all be there at camp grounds and hotels Thursday night. All are welcome to stop by for both events. Breaking up camp Sunday morning. We have a few classic boats and live in Milford, OH and would be interested in getting together sometime this summer. We do fiberglass boat repair (Haynes Fiberglass) and are up in Fairfield, OH quite a bit as we do warranty repair for many of the boat dealers. Anyone have a link to some info about this show?